The bodies of box elder bugs are primarily black in color and have distinct red lines along the thorax, wings and sides. Their wings are flat across their back with red and black markings. Box elder bugs adults typically measure between 11mm and 14 mm long. During the Spring and Summer, you will find them primarily around boxelder trees (hence the name) as they feed on the seeds either on the tree or those that have fallen on the ground. They can also be found on or around other fruit-bearing trees. During the winter months, they can be found in areas that provide warmth and harborage. This is typically in a structure or protected area near their food source. It can include sheds, garages, attics or even wall voids in a home or building. 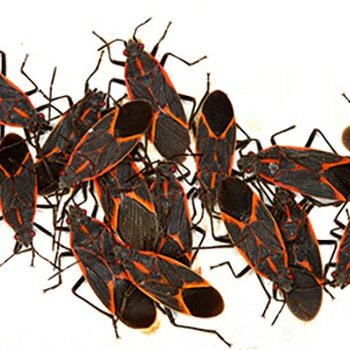 Box elder bugs’ primary source of food is the seeds from the boxelder tree, however they can also be found feeding on silver maples and sycamore maples. They will also feed on tree-dropped fruits such as apples, prunes and pears. Look for their common food sources mentioned above to determine if a population may be nearby. Also, in an effort to prevent an infestation indoors during the winter months, look for obvious gaps or holes in a home that box elder bugs could use to gain access inside. This could include gaps around windows, doors, gable vents or roof lines.